Nothing soothes the senses like the sound and sight of a water feature. Desert Environments offers a wide range of possibilities for your custom-designed water feature in Paradise Valley. We listen to your ideas, take a look at the space you have planned for the feature, and get to work going over options with you. Once you have selected a water feature design for your yard or commercial space, we handle the installation as well. 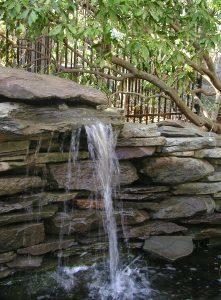 Call us for design and installation for your pool, pond, water fountain, rock waterfall, and more. We handle the planning as well as sales and installation. You don't need to call multiple contractors to handle the different aspects of implementation. We handle it all in-house. No outsourcing from unknown contractors. We use the best products and most trusted manufacturers for pumps and parts, and we back all our parts and labor with some of the best warranties around. Desert Environments is a trusted source for all your landscape design. Pools that include a waterfall or other moving water offer an added element of relaxation. You can enjoy the moving water while in the pool and relax to the sound of trickling water when you're not. We offer a vast selection of in-pool water feature options. Ask us for a portfolio of ideas to get you started. 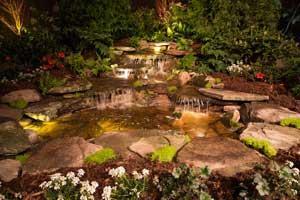 Our landscape designs seamlessly merge ponds and waterfalls into the natural setting. You will not see or hear the annoying pumps and motors. Our products are made to work silently and be integrated out of sight. Each design is customized to incorporate your personal style and the surrounding environment. Call now to find out more about adding a water feature to your Paradise Valley yard or outdoor business surroundings.